If my blindingly pale skin hasn’t burned out your retinas, I’d like to show you my new hat. My new hat that I finished like a week and a half ago and just now got around to taking pictures of. Sorry! This is the last whimper of my hat knitting obsession. Probably. I knit myself six hats in the last 6 months, so I should be good. Maybe. 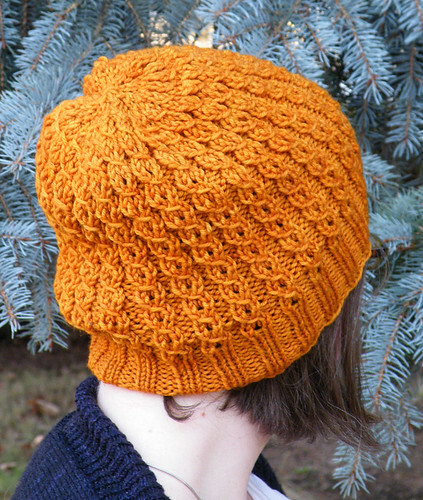 It’s another Slouchy Copy Cat Hat, which is a super terrific, easy but still interesting pattern. The yarn is Dream in Color Classy in Gold Experience, a color that I am in love with at the moment. ← I can’t make up my mind! OH GOD that is the best color EVER. My friend made me this hat (in a different shade of Classy) and it’s my favorite hat ever. Isn’t it a great color? I’ve been really in love with honey yellows lately. Beautiful hat with a beautiful girl with beautiful hair, skin and glasses! You are radiant, Em! sweet – and you look amazing!!! I have some gold yarn for the French Press Slippers too – except mine is Patons. Is that one of my grandbabies or is that the neighbor kid? Great hat, great color, great daughter! Hey girl – you look amazing. You have lost a bunch of weight in your face… have you looked at your pics lately? You are so healthy looking.. nice knitting too.. C: carry on.. 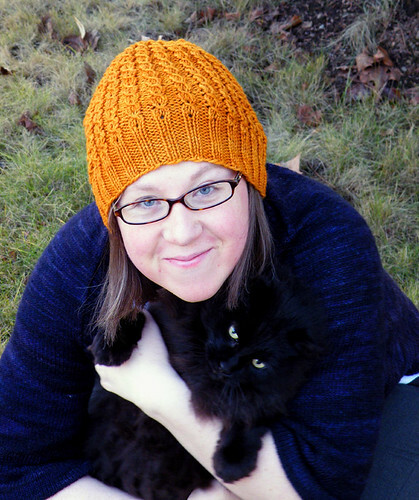 I love this hat and your cat so !!!! and the coolour !!! !